Chief of Neurosurgery at San Francisco General Hospital and Professor of Neurosurgery at the University of California San Francisco (UCSF). 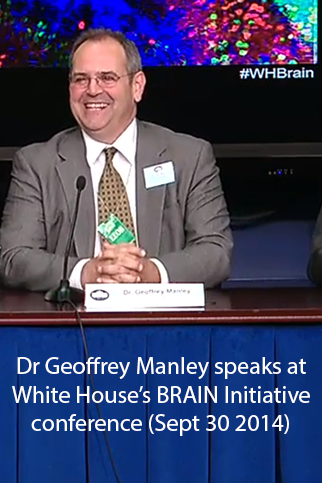 Dr. Geoffrey Manley is a trauma neurosurgeon with clinical interests in brain injury, spinal cord injury and neurocritical critical care. Dr. Manley is an internationally recognized expert in neurotrauma. He has published over 120 manuscripts that reflect a wide range of research interests from molecular aspects of brain injury to the clinical care of head trauma patients. He has helped to define new molecular mechanisms of injury to the nervous system that may lead to new treatments for these devastating injuries. He is also considered a leader in the rapidly growing field of advanced neuromonitoring and clinical informatics for critical care. Dams-O’Connor K, Spielman L, Singh A, Gordon WA, Lingsma HF, Maas AI, Manley GT, Mukherjee P, Okonkwo DO, Puccio AM, Schnyer DM, Valadka AB, Yue JK, Yuh EL, Casey AT, Cooper SR, Cheong M, Hricik AJ, Knight EE, Menon DK, Morabito DJ, Pacheco JL, Sinha TK, Vassar MJ. The Impact of Previous Traumatic Brain Injury on Health and Functioning: A TRACK-TBI Study. J Neurotrauma. 2013 Dec 15; 30(24):2014-20. Manley GT, Maas AI. Traumatic brain injury: an international knowledge-based approach. JAMA. 2013 Aug 7; 310(5):473-4. Weiner MW, Friedl KE, Pacifico A, Chapman JC, Jaffee MS, Little DM, Manley GT, McKee A, Petersen RC, Pitman RK, Yaffe K, Zetterberg H, Obana R, Bain LJ, Carrillo MC. Military risk factors for Alzheimer’s disease. Alzheimers Dement. 2013 Jul; 9(4):445-51. Inoue T, Lin A, Ma X, McKenna SL, Creasey GH, Manley GT, Ferguson AR, Bresnahan JC, Beattie MS. Combined SCI and TBI: recovery of forelimb function after unilateral cervical spinal cord injury (SCI) is retarded by contralateral traumatic brain injury (TBI), and ipsilateral TBI balances the effects of SCI on paw placement. Exp Neurol. 2013 Oct; 248:136-47. Grossman AD, Cohen MJ, Manley GT, Butte AJ. Altering physiological networks using drugs: steps towards personalized physiology. BMC Med Genomics. 2013; 6 Suppl 2:S7.